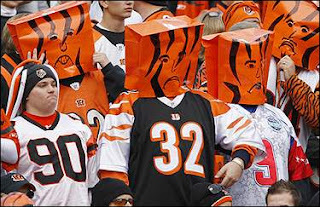 Despite the way the season has gone, I have remained reserved with the feeling that all hope is not lost for my Cincinnati Bengals. However, after today's resurgence of self-pity and un-interest, that has befallen the Bengals throughout their history, I have decided to throw in the towel. Yes, I called them the Bungles, a title I despise, in the headline. And, yes they deserve it. Every week has been a different beast to overcome. For most weeks it was injuries to the linebacker corp that has yet to fight its way out of a paper bag (but its not their fault). Other weeks it was a lack of a running game, but with Kenny Watson and Rudi Johnson splitting carries, it has been better, not good, just better. Coaching calls have been questionable, as much as Mike Brown's loyalty. Now, as the offense and especially Carson Palmer have been the only faint bright spot on the team, they have befallen Bengal-Nation (is there one?). Today I watched in horror and then disgust as an un-interested Palmer through not 2, not 3, but 4 interceptions. Two of which were returned for touchdowns, by the mediocre DB Antrel Rolle. What makes me almost puke however, is how there were about 3 or 4 more passes deflected that would have been picked off by a better defensive team. And all the while, here I sit watching my fantasy football team drowned to the tune of 4 T.O. touchdowns from the soon to be division winner in my league. Football at this point, couldn't be any worse. Probably not even if I was a Dolphins fan, because they don't even have the weapons going to waste week by week as the Bengals do. I am fed up with the Bungles and football at this point. Disdain, is not a harsh enough word for my feelings right now. But, through it all, the Bungles can about punch their ticket for a lottery pick in the NFL draft next year, which should yield a top-tier LB or DE. But, with the result of drafts-past for the Bungles, I'm sure I should expect nothing too great and I should instead move my interest to baseball season which is ONLY 132 days away.